Hey everyone! Who loves a road trip?! Did you catch my announcement in Monday’s Modern Pant Suit post?! I cannot wait to head down to Los Angeles and spend some time creating great blog content for all of you while I am down there. Since I’m doing a road trip from Vancouver, Canada to Los Angeles I thought it would be fun to share with you all some of the items I am going to be packing. Of course I am packing a ton of things for a month long vacation; but these are items that will be my key pieces of clothing and accessories for the road trip part of the vacation. Click on any image below to be taken directly to the product, and stay tuned below each photo for some information on the item and why it is a road-trip must have! 1. DIFF Sunnies: The DIFF Becky Sunglasses are a timeless shape, and I love this particular gold shade. If you don’t know DIFF already; you need to! They make good quality sunglasses and for every pair of sunglasses sold they donate a pair of glasses to someone in need through one of their charity partners. 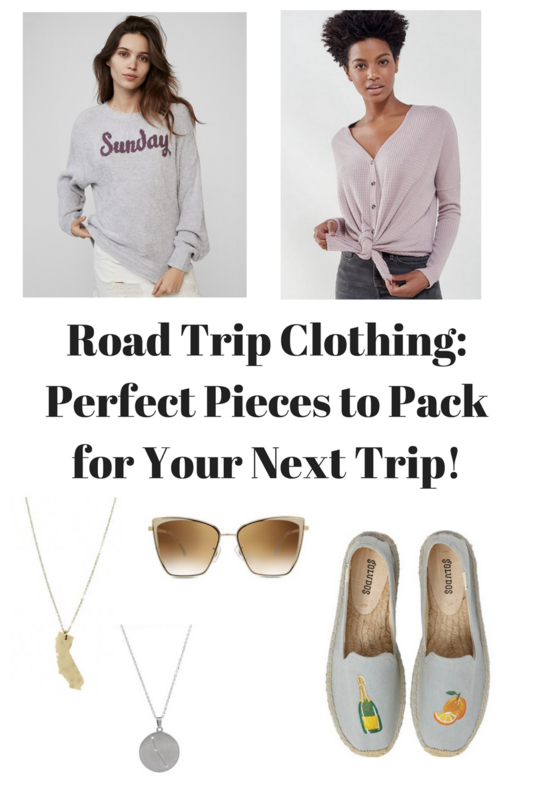 Such a great company to support… and an easy way to look stylish on a road trip!! 2. “Wear-With-Everything” Jewelry: For a road trip you aren’t going to be busting out your fanciest jewels, nor will you be changing jewelry all the time. What you need are two to three pieces of wear-with-everything jewelry that you can wear with almost any outfit you have. For me, I will be bringing two pendant necklaces (one gold, one silver) as between so that between those two I’ll have a necklace that matches every outfit! My California State Pendant Necklace in Gold is, clearly, perfect for driving to LA. For my silver necklace I decided to go with my new Aries pendant. I love the size of the circle pendant, and the three swarovski crystals add just enough sparkle. 3. Cozy Long Sleeve Top: For a road trip you need a really soft, really cozy long sleeve shirt in case you get cold! Every blogger out there has been raving about this waffle knit top from UO for months and I finally ordered it last week and now understand what all the fuss is about. It really is incredibly soft and the fit is somehow universally flattering. It’s just the right amount of baggy to drape in a way that screams effortless chic. 4. Leggings: Let’s be real. If you’re going to be sitting in a car for hours on end you need to be comfortable. Leggings are a driving staple; and these Zella leggings are my favorites. My other top pick is the VSX workout tights, but they seem to be sold out! 5. Mimosa Embroidered Shoes: HOW. FRIGGIN. CUTE. ARE. THESE!!! For a roadtrip you just need comfy (but cute) footwear you can drive in. These are literally the perfect shoe. I just ordered a pair! 6. Suede Baseball Cap: You can’t survive a road trip without a ball cap! I love this black suede one because it is simple and classic and will (therefore) work with almost any outfit. Also it is $15, so you can’t beat the price! 7. Sneakers: In addition to a pair of cute driving shoes, you always need a pair of sneakers for your road trip. Great for driving, and you never know when you’ll want to stop along the way and explore something! I am in love with these pale pink sneakers I got a few weeks ago, so these will be my 2nd pair of shoes for my road trip. 9. 2 Cozy Sweaters: Again, since road trips are all about comfort, no road trip wardrobe is complete without two comfy sweaters. I’ll be packing this “out of office” sweater and this “Sunday” Graphic sweater. 11. Weekender / Duffle Bag: This bag has been my ride-or-die travel bag for the past three years (…which really shows the high quality of the bag – it’s a miracle it’s still alive!) Every roadtripper needs a good duffle bag and what I like so much about this is the separate compartment at the bottom. Perfect for storing shoes so they don’t get the rest of your clothing dirty! 12. Silk Scarf: While a ball cap is a must-have, you aren’t always going to want to have a hat on your head! This floral scarf is the perfect way to tie your hair back so you can cruise with your windows down! 13. Cotton T-Shirt Dress: This striped dress is such an effortless piece that looks good, but is super comfortable. You won’t want to wear jeans/leggings every day you drive so a cotton dress is a must-have! Since I’ll be starting off in the snow and moving towards warmer climates, I know I’ll be wearing this dress on the last legs of my trip once I start getting into that Southern California sun! 14. A WINE HANDBAG: Yep. This miraculous thing exists. This handbag holds a bottle of wine (and keeps it cool) and has a hidden spout for you to pour from. One of the best parts of roadtrips are the unexpected stops and detours into cool spots – and having this on hand for a sunset in a park, a dinner overlooking a city view, etc. is a definite must-have in my books! "The Pant Suit for Young Professional Women"
"Tweed Dress with a Bow – Early Spring Style"
Great pieces, I love those espadrilles! Thank you so much Elise! And yes, aren’t they espadrilles ridiculously cute!? I feel like I’ll be wearing them to brunch every Sunday in the summer haha.